Good optics, smart glassing, patience, and common sense are the recipe for a successful early-season mule deer stalk. Early-season, high-country mule deer can be the ultimate bowhunting experience with the right approach. Western early archery seasons—normally August and September—mean climbing into high country to bowhunt velvet-antlered muleys. These dates typically find deer at the highest elevations, often well above timberline. These relatively open habitats make glassing productive, but stalking highly challenging. To start choose high-objective, 8- or 10-power glass in the 8x40 to 10x50 class. This is no place for shirt-pocket compacts. A spotting scope is also welcomed, allowing crossing deep canyons or shale hillsides without physically killing yourself to determine a distant buck’s trophy quality. While glassing, random sweeps produce poor results. Instead, learn to employ a system assuring prime habitat is probed thoroughly—especially in terrain where deer might be situated a mile away or are bedded tight for the day. Seek movement especially, but also shiny spots, conspicuous patches of color, or horizontal lines against vertical trees. Once you’ve spotted a buck don’t rush into a stalk before you’ve determined the direction of prevailing wind first of all, but also how terrain might direct its flow. Second, plan a sensible plan of approach. Remember mountain wind currents are dictated by temperature—flowing downhill when cool or shaded, uphill when it’s warm or sunny. Carefully consider these factors to assure you won’t give deer your scent. Choosing sensible approach routes involves avoiding obviously noisy or open ground that’ll give you away. Earmark key landmarks that help reorient yourself once you arrive on the scene. Patience is the first order. Traveling or feeding bucks sometimes require quick decisions, though more often you’ll find early-morning bucks in places allowing you to wait and watch. By allowing a buck(s) to bed, less guesswork is involved during the stalk. In general, look for bucks to bed around 10 a.m. By noon bucks normally raise to stretch and choose a new bed. Once he makes this second move, it’s time to start your stalk. You can now count on him staying put for several hours. Stalking is bowhunting at its most elemental. Of course wind dictates approach but also choose routes allowing quiet steps; game trails, bare soil, damp ground. Don over-boot stalking slippers for added stealth across shale or gravel, or remove boots and proceed in wool socks. Encountering cluttered sticks or leaves, carefully clear clean stepping spots while advancing. Once in range you might find no shot is offered. Don’t panic. Sit tight and wait. Press the issue and you’ll see only a deer rear rocketing away. Wait for that buck to stand on his own accord and he’s all yours for the taking, assuring a calm, stationary target. 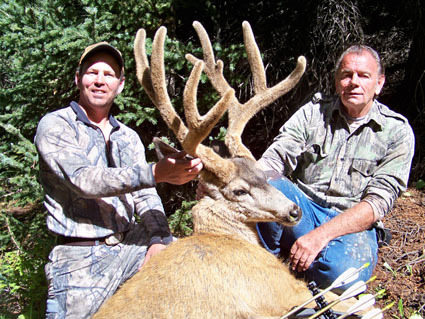 Stalking early-season, high-country mule deer can be the ultimate bowhunting experience. It’s a beautiful place to be when it’s broiling hot at lower elevations, witnessing trophy antlers is typically par, and the thrill of a face-to-face stalk is bowhunting at its absolute pinnacle. Make it happen for you this season by following this common-sense advice and remembering it’s all about patience, patience, patience!